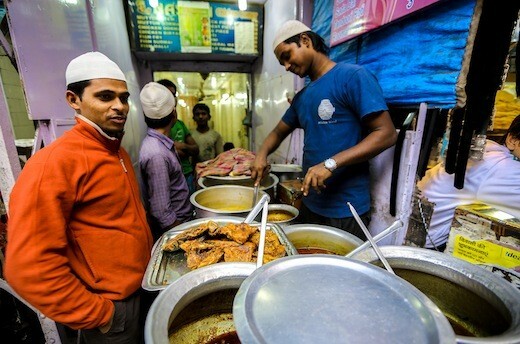 In the sprawling mass of Old Delhi – its hidden mosques, giant gates and crumbling mansions – are a handful of eateries that have locals and visitors coming back for more. This is the biggest bazaar of them all, home to some of the largest wholesale trades in Asia. Thousands throng its streets every day. 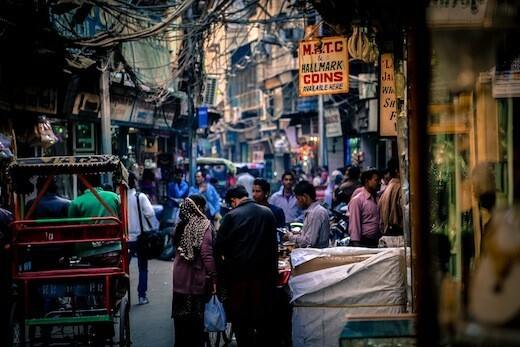 For many sightseers, the first glimpse of Old Delhi is when they emerge from the modern, air-conditioned metro station into the chaos, dirt and hardship of Chandni Chowk. What was once the grand Mughal capital now remains studded with royal buildings and crumbling balconies tangled in a maze of electrical wires. At street level, hawkers bellow, dogs scavenge through the waste, and frail rickshaw pullers struggle with loads five times their own weight. 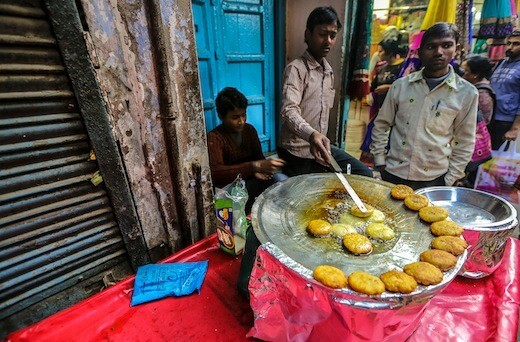 Yet, a stagger and a push away, among all the disorder, is the heart of Delhi’s street food. Here you’ll discover the city’s appetite and its penchant for sinful savouries and snacks. 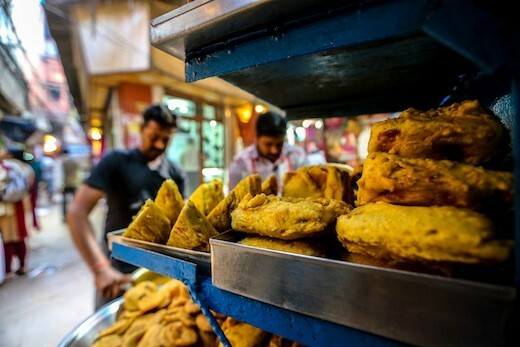 From kebabs to kheer (a sweet rice pudding) and lassi (sweet yogurt-based drink), to puri (deep-fried Indian bread), the range of tasty street food is vast. But the surprising and memorable dishes are not in upmarket, plush restaurants. In India, the best is often to be found in the most unappetizing of locations – in the heat, dust and flies of its streets. Wend down to one such alleyway and you’ll see the Paranthe Wali Gali or “the by lane of fried bread.” Here a series of makeshift stalls known as Dhabas churn out flavoursome wheat flour disks for just a few rupees. Walk in to any of the four remaining eateries and the place is a grease factory! At its simplest, a paratha is crisp and a little salty but it comes with a variety of stuffings including potatoes, onions, cauliflowers, eggs or paneer, the Indian cottage cheese. Served with standard garnishes like chutney (mint sauce) and pickles, the thick parathas are deep-fried and glistened with oil. As you wait your turn, you’ll have time to watch the spectacle. In an open-air kitchen, the cooks sit facing the street with ingredients arranged on a platter beside them. Throwing in a fistful of stuffing into the dough ball, they wrap it in and flatten it out as it expertly is tossed into the wok. For generations, these food vendors have been in business of selling parathas exclusively. One of the shops even has a framed picture of the Indian Prime Minister, Jawaharlal Nehru, enjoying his paratha back in the day. 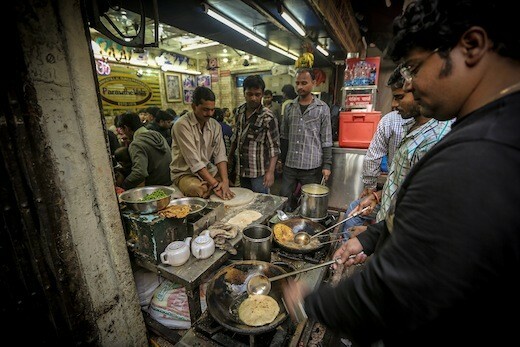 But there is more for gastronomic thrill seekers in Old Delhi. A short walk leads you to the “Old Famous” shop, where it’s been around since 1884. 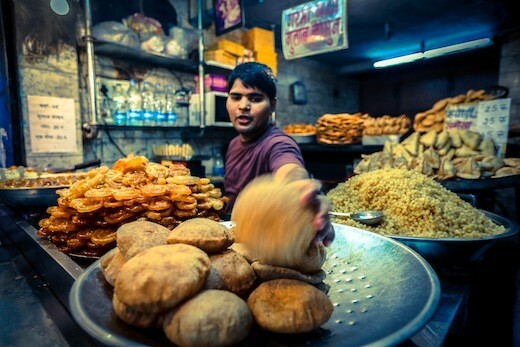 On the menu are only samosas and jalebi – sugary rounds of fried batter, often with an orange tint. India’s unique sweets are worth sampling. 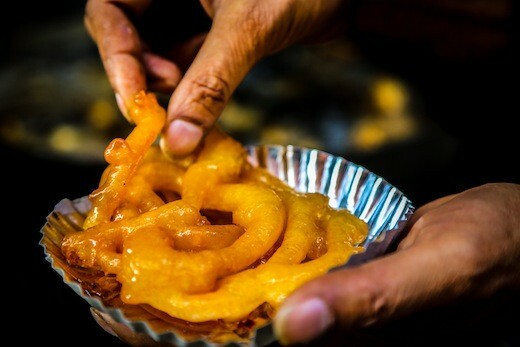 Milk confectioneries, gulab jamun, rasgullaa and ras malai are popular specialities but at the “Old Famous” shop, jalebis are the ultimate sugar hit. As visitors flock to such renowned spots in the old city, its residents teem towards roadside carts, which are less expensive. Around ten million street vendors across India peddle tasty morsels every day to ensure that the public eat their way through the streets of the country. This has long been a tradition of the India's boisterous and chaotic spirit. As an outsider, however, one must identify the right places to taste some of its street side delicacies. Else the infamous Delhi Belly would strike down the adventurous snacker! At Karims, the culinary veterans of its kitchens practise their craft just as their forefathers had centuries before. Here you'll have time to watch the master at work, packing soft meat on to skewers before tipping them quickly on to plates and into waiting hands. 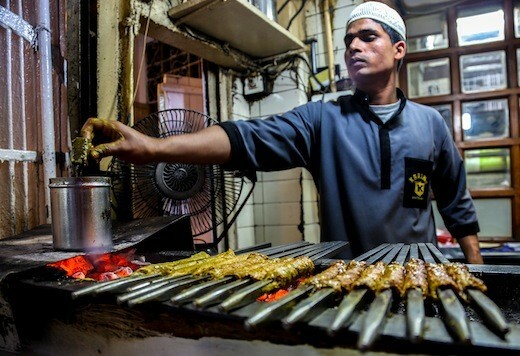 Undoubtedly, they are some of the finest kebabs in Delhi. Vegetarians can opt for the cottage cheese skewers. Old Delhi is a wonderful place for breakfast – try the bedmi aloo (deep-fried spiced bread with a spicy potato curry) at Shyam Sweets. 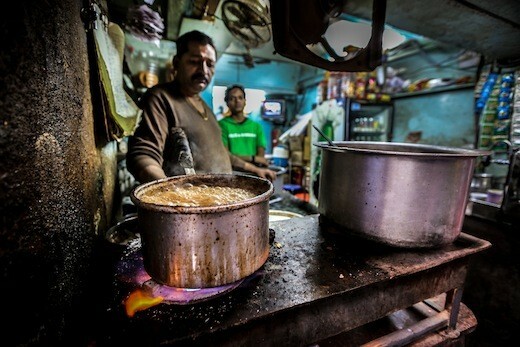 Lastly, if you are sincere to experience the real life of Old Delhi, then have chai (the local tea) in the locality. The Walled City has at least a dozen chaikhanas (tea houses) hidden in its narrow lanes. They serve tea and classic teatime snacks like fen and rusk that are made in the area’s local bakeries. With a cup of chai, chat up with the locals and dwell on the city’s layered history – its past and present. MOSKA NAJIB, has been taking photographs for several years and her photographs have appeared on various journals, including the BBC News website. A journalist by profession, she has worked for the BBC as a producer and correspondent. In the past five years, Moska has travelled extensively to many parts of South Asia reporting through film and photography. A full-time adventurer and globetrotter, Moska's interest lies in the areas of documentary photography. Recently, she was selected as the only Afghan finalist for Tourism Australia's Best Jobs in the World competition. Great Job Moska for putting the theme together. Liked the idea a lot. Pictures are evocative and simple. Well Done. 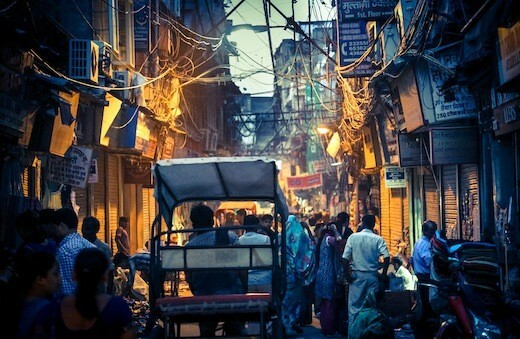 Let me know when you plan a shoot again on the streets of Delhi. We can do this together. Muski - these are fabulous photographs! They really tell the stories of the old city. My mouth watered looking at the succulent kebabs and jalebis! You have captured them beautifully! Well done! Fabulous photographs Muski and so well written!!! Great article and so true. I've had the best dahi wadas at Chandni Chowk. While your pictures are amazing, your writing is amazing! I could literally recreate the streets in my mind based on your writing! It's rare to read someone who is so vibrant in their prose that they can actually get a reader to feel and see through their other senses what the writer felt in that moment; definitely feel like I was there!! You go girl! Take me with you next time. I've only been to Karim's. Nine if the others. Proud of an Afghan young lady with such talent. Beautiful illustrated, I can sense the aromas :) Thanks for sharing!